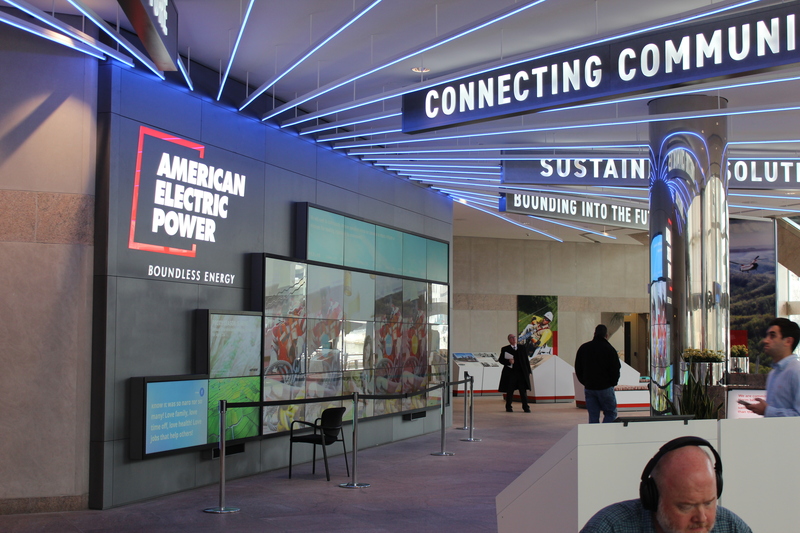 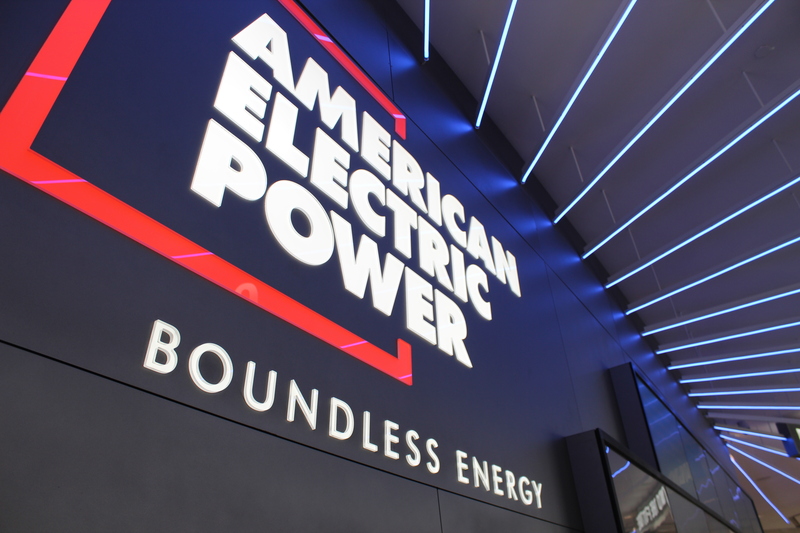 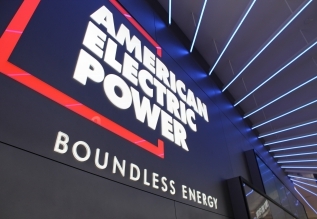 With the energy industry in the midst of a historic transformation, American Electric & Power decided that it was time to update the Columbus, Ohio headquarters lobby exhibits to illustrate how AEP is transforming to meet the technological challenges along with company goals of becoming more agile and customer focused. 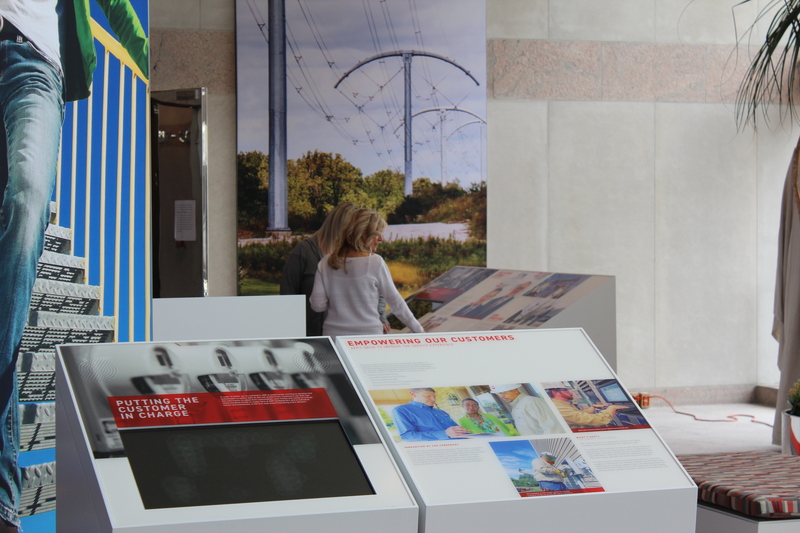 AEP turned once again to the team of The History Factory and Capitol Museum Services to update their message to customers and employees alike. 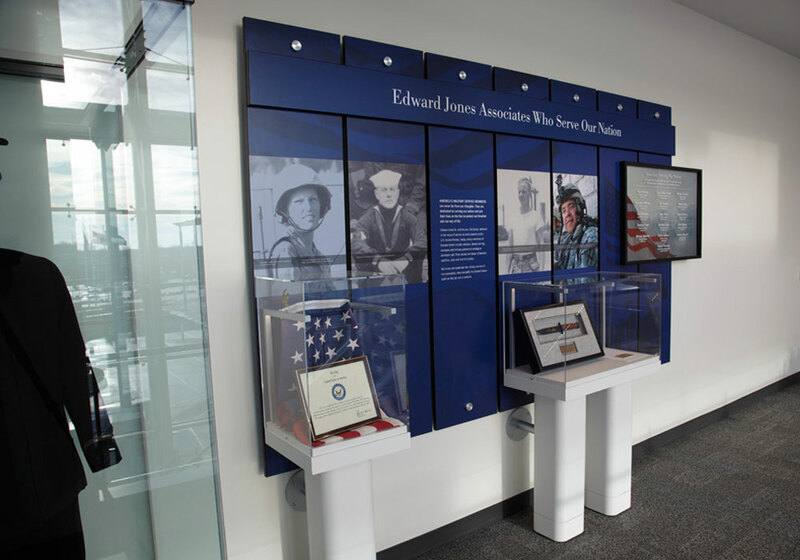 This same team produced a more static lobby exhibit for the headquarters building in 2008 which had stood the test of time physically, but the content and delivery method were out of date. 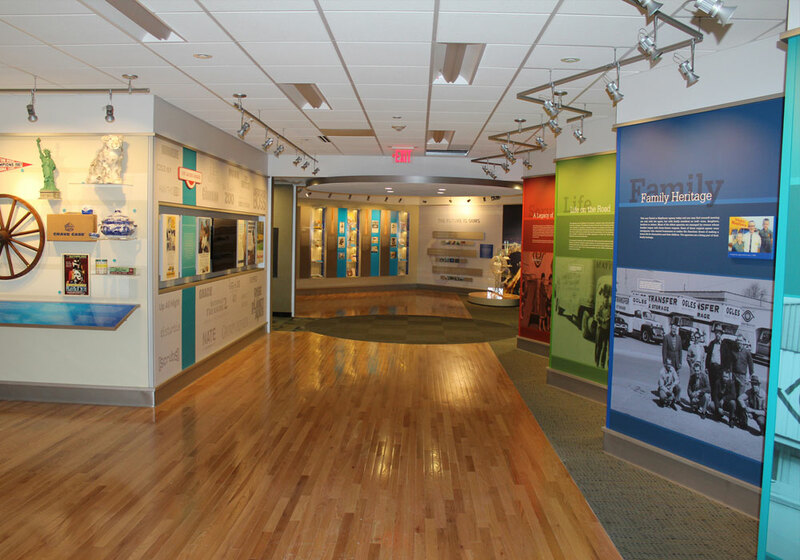 The more static elements of the new exhibit plan were multiple pods that held artifacts, interpretive graphics and in some cases monitors and touchscreens. 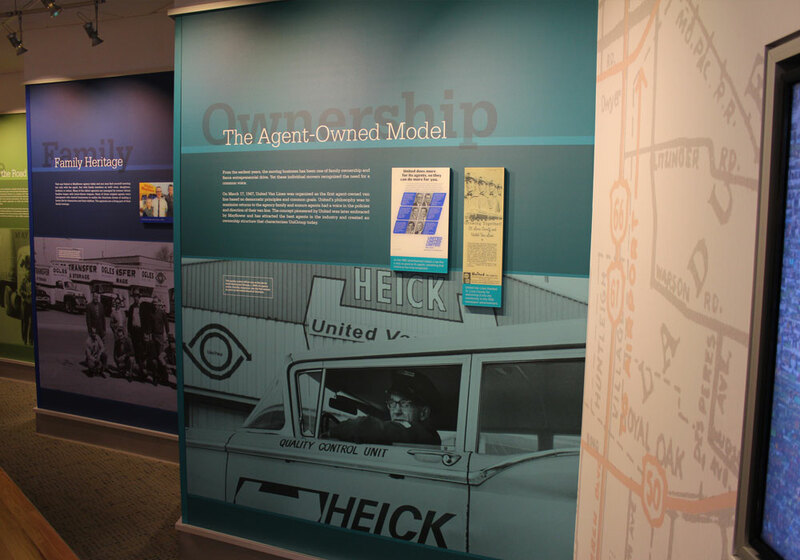 Working with the History Factory design team, CMS detailers designed the pod construction so that they can be easily moved around the lobby as conditions, such as events, may dictate. 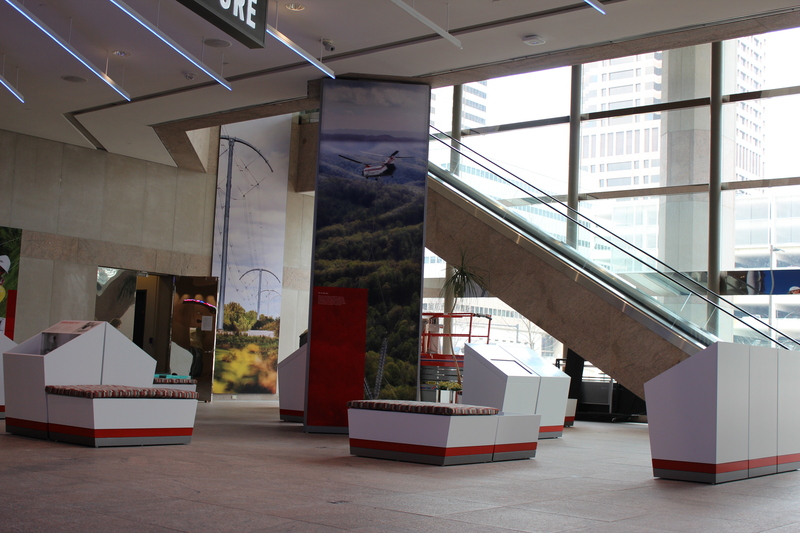 All pods are interchangeable without difficulty and connect with custom steel brackets designed and fabricated by CMS. 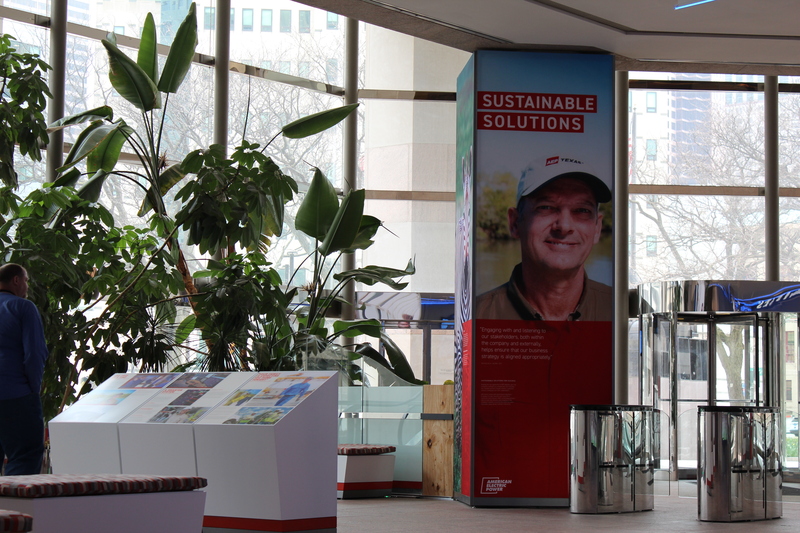 Large framed fabric graphics adorn many wall surfaces and the large building columns were converted to exhibit space by custom framed structures that contain fabric banners that can be easily replaced if the client wishes to change the message. 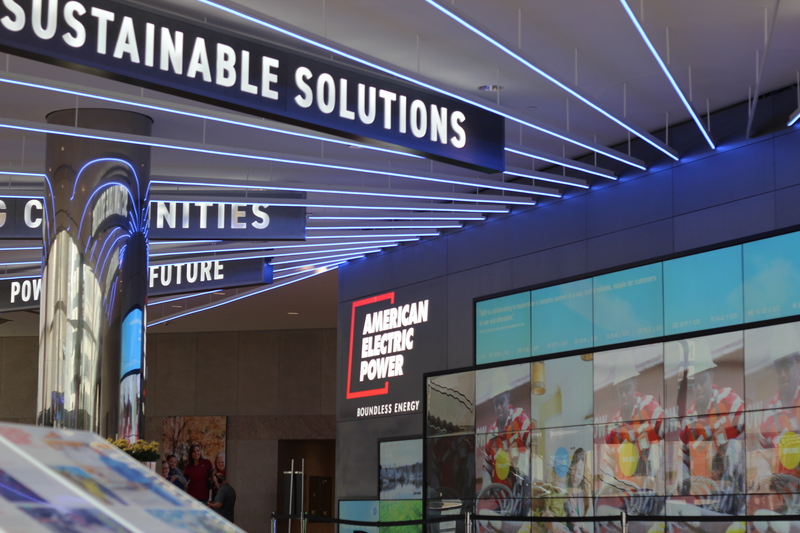 The centerpiece of the exhibit is the large World of AEP interactive video wall consisting of twenty six high resolution 55” monitors, eighteen of which create one large touchscreen interactive. 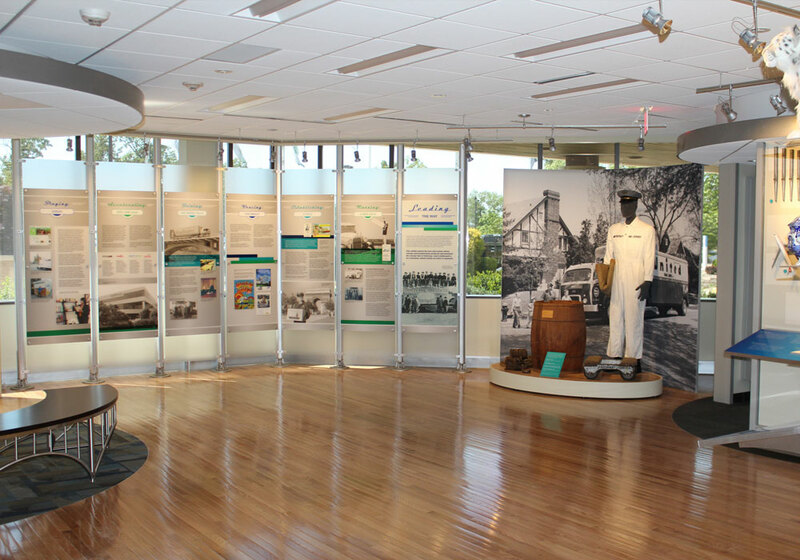 Visitors and employees alike are welcome to interact with the wall in order to delve into multiple topics concerning AEP. 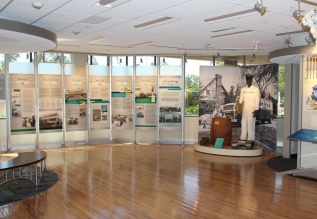 Portions of the touchscreen area can be switched to an event mode when the lobby is being used for meetings or other events. 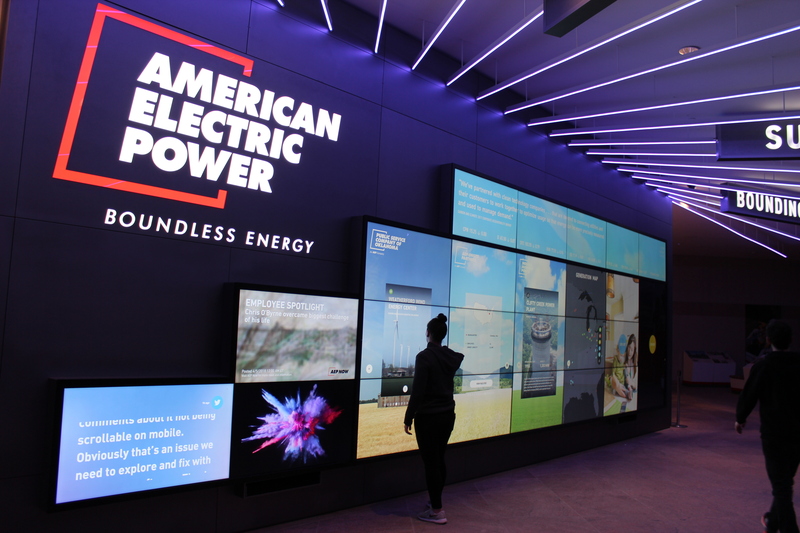 Monitors across the top display a stock ticker, an important issue to AEP as its stock has paid a dividend every quarter for over 100 years. 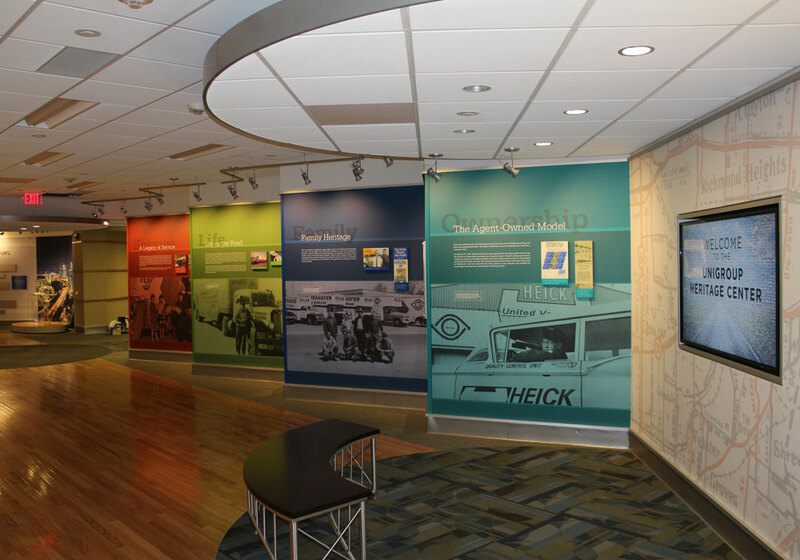 Bringing focus to the wall and pulling the entire exhibit together is a lighting system in the ceiling that can be customized via a smart phone app to change colors and speed. 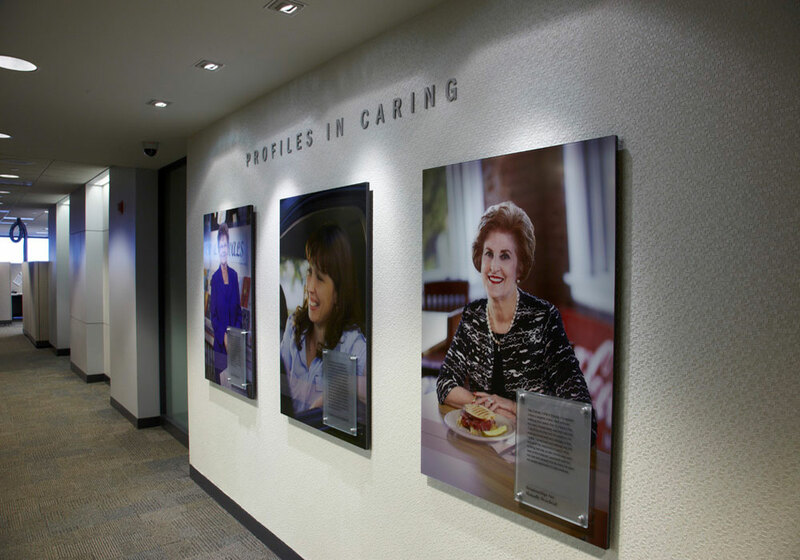 Very large lit text structures in the ceiling highlight the utility’s core values. 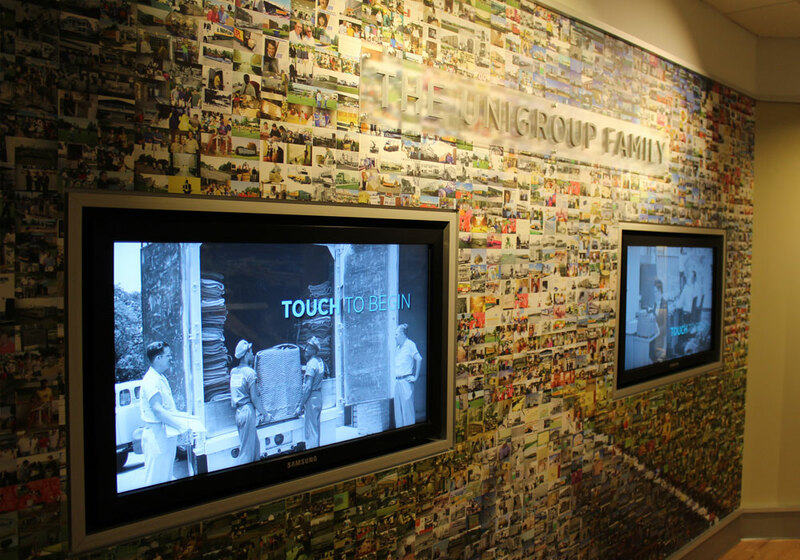 History Factory – Unigroup “Heritage Center” displays are intended to preserve, document and tell the story of Unigroup’s growth, evolution, heritage and corporate culture. 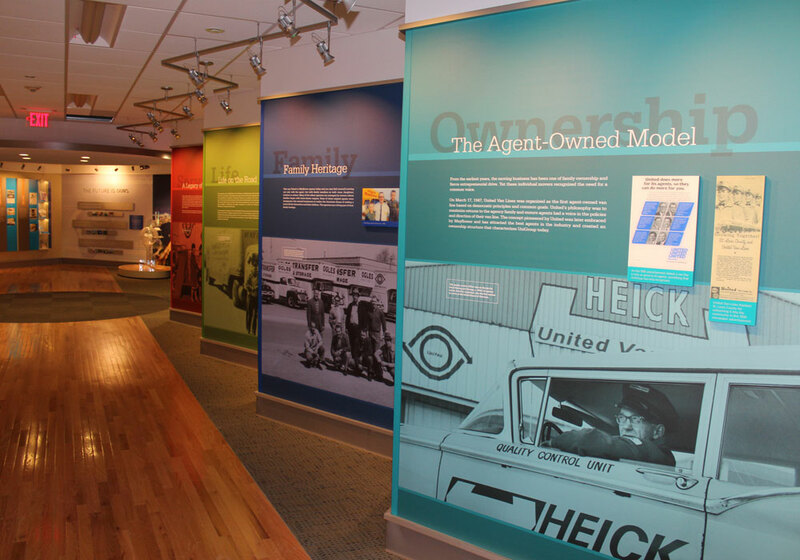 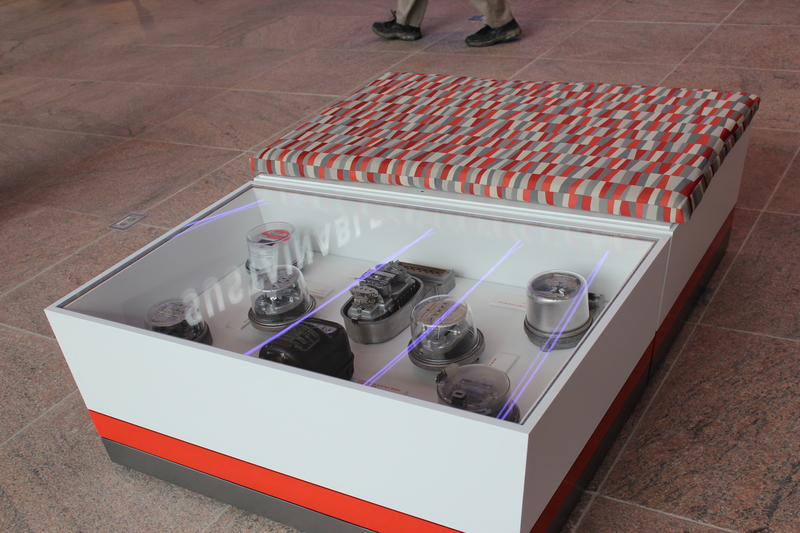 CMS was contracted for the detailing, exhibit fabrication, graphic production, installation services and A/V integration. 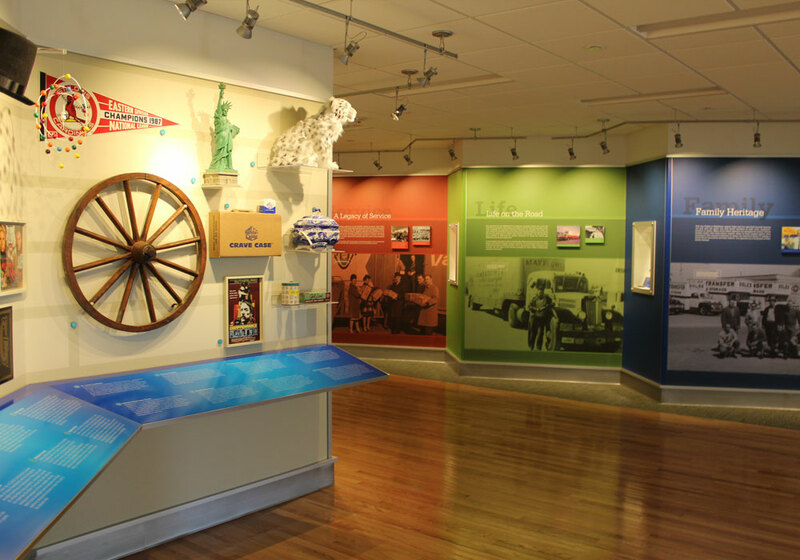 Work on this project is a good example of what can happen when museum techniques and technologies are blended into a corporate environment. 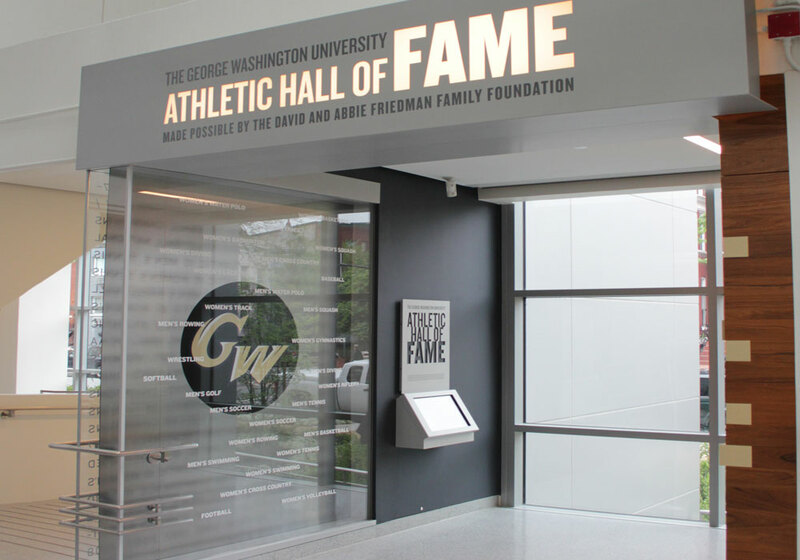 George Washington University – Athletic Hall of Fame. 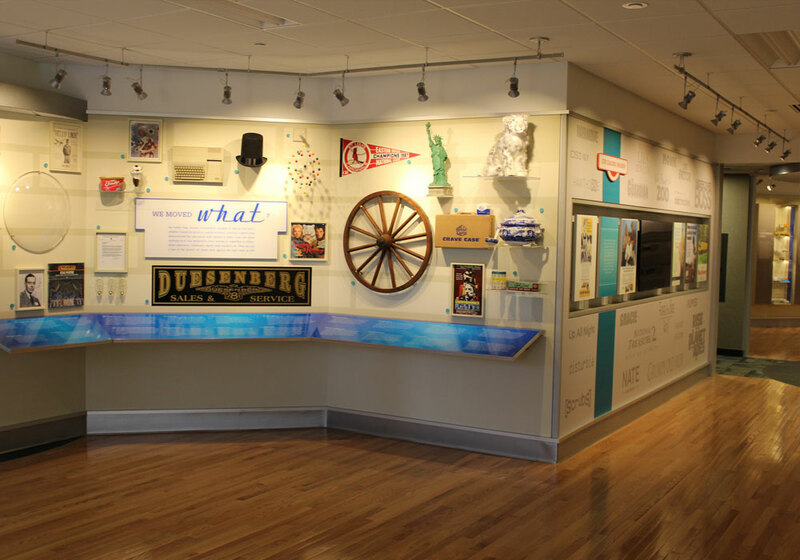 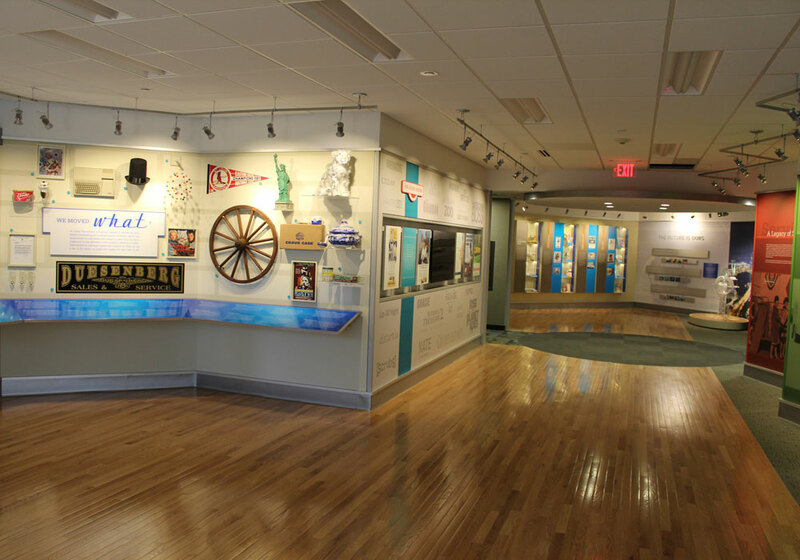 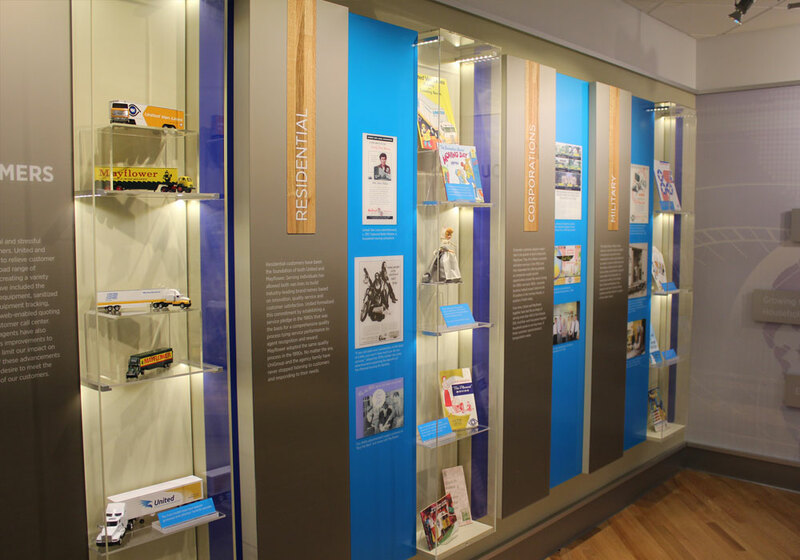 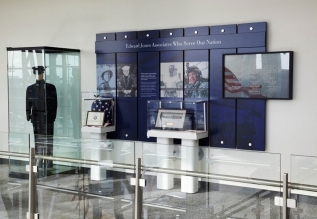 CMS provided project management, value engineering, detailing, fabrication, art production, Audio Visual equipment and exhibit installation services for The Charles E. Smith Centers, Sports Hall of Fame Exhibit. 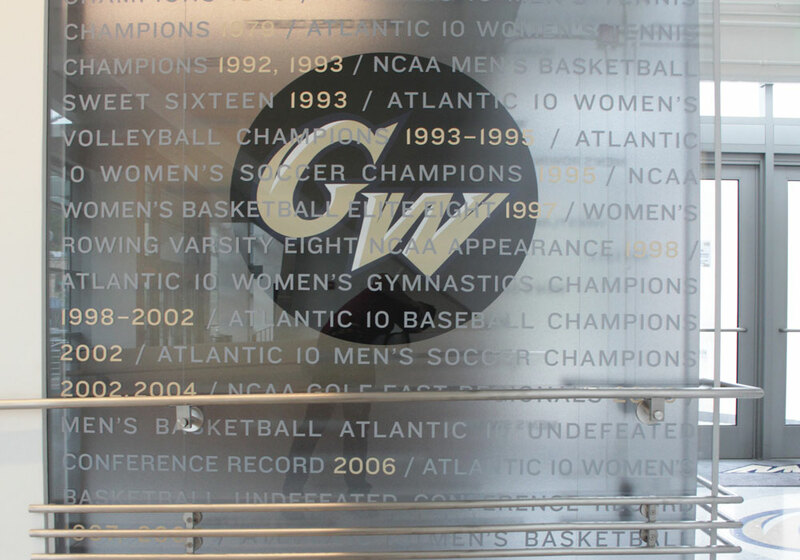 The Smith Center has served as home of the George Washington University Department of Athletics and Recreation for more than 30 years. 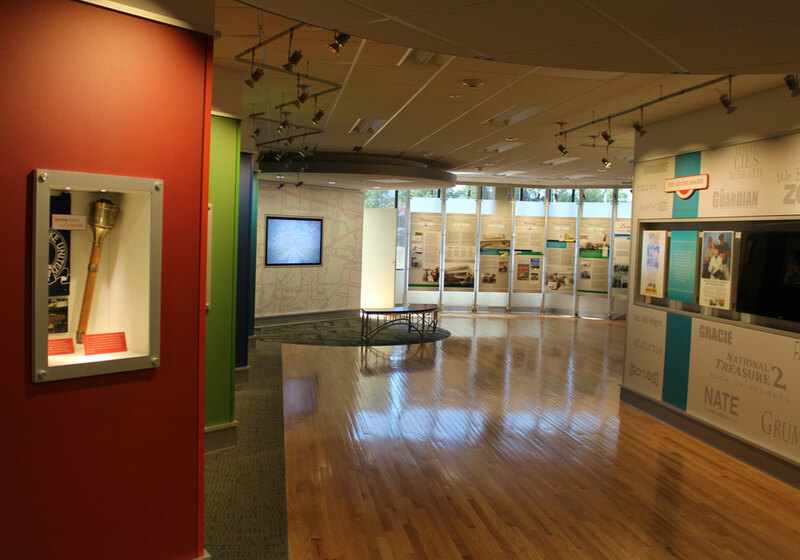 The exhibit, which utilizes a small amount of square footage was quite involved. 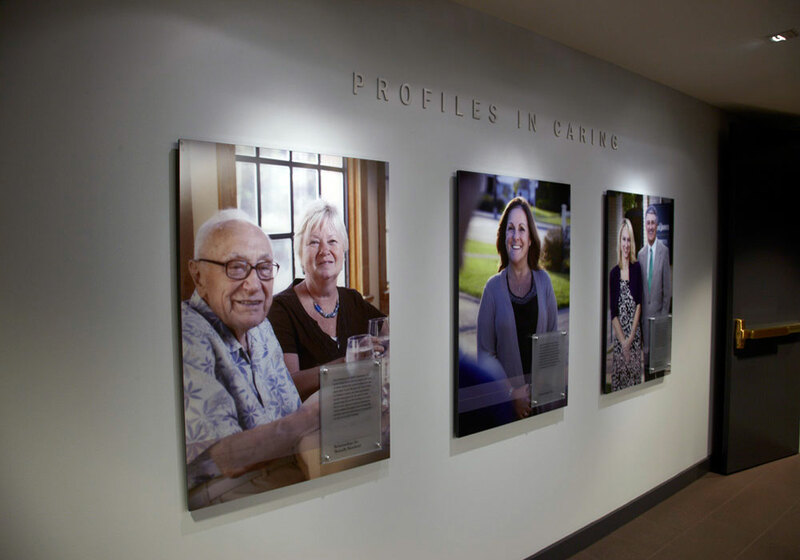 Custom frame metal work was created overhead to cover existing pipes, wires, and conduits and then cladded in bead Blasted sheet steel with a clear coat finish to improve aesthetics. A 7‘ wide x 7’ high hinged wall was produced with finished strips of solid teak, mixed with 1, 2, and 3 inch thick painted acrylic blocks each with the silk-screened names of an honoree, creating an interesting, visual depth for this attract wall. 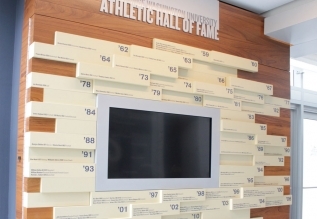 An over-sized grill was carefully machine-fit in the bottom of the wall to maintain proper air flow in order to keep the audio visual equipment cool during operating hours. 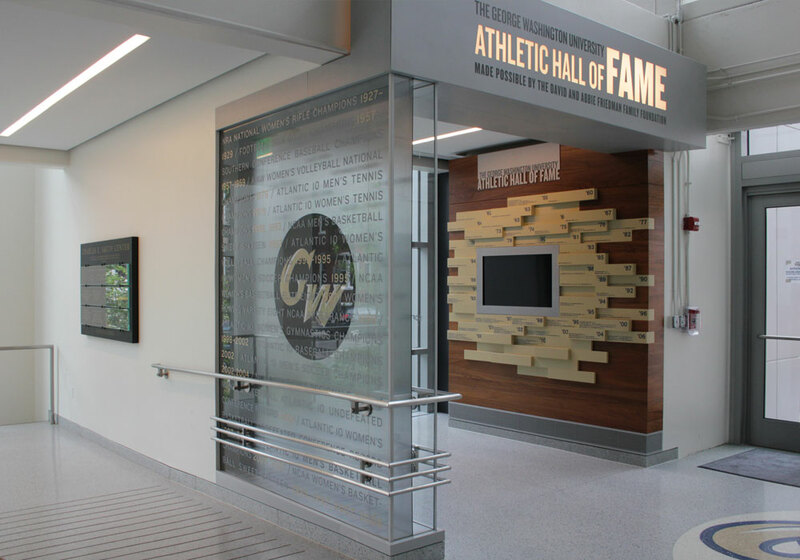 A three sided glass display wall, with a 3-form custom acrylic central GW logo panel invites the crowd to the space. 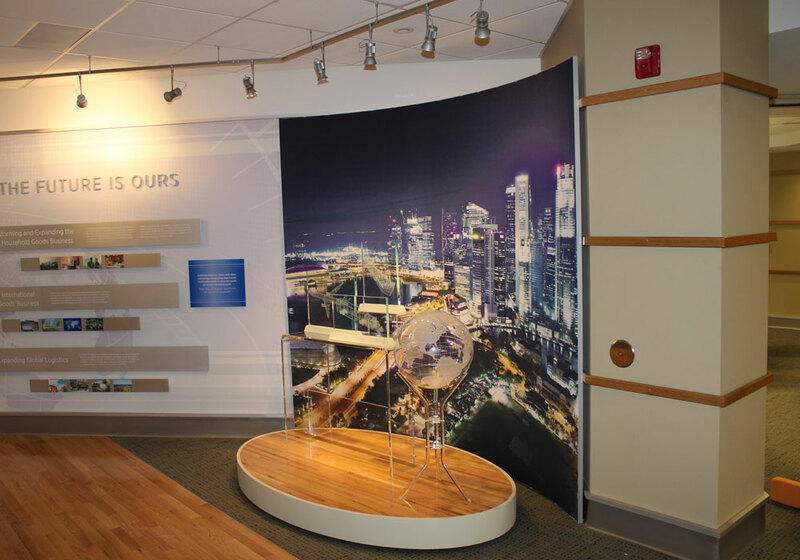 This glass wall also supports a custom stainless steel hand railing with custom terazzo floor and kick tiles finished to match existing finishes in the environment. 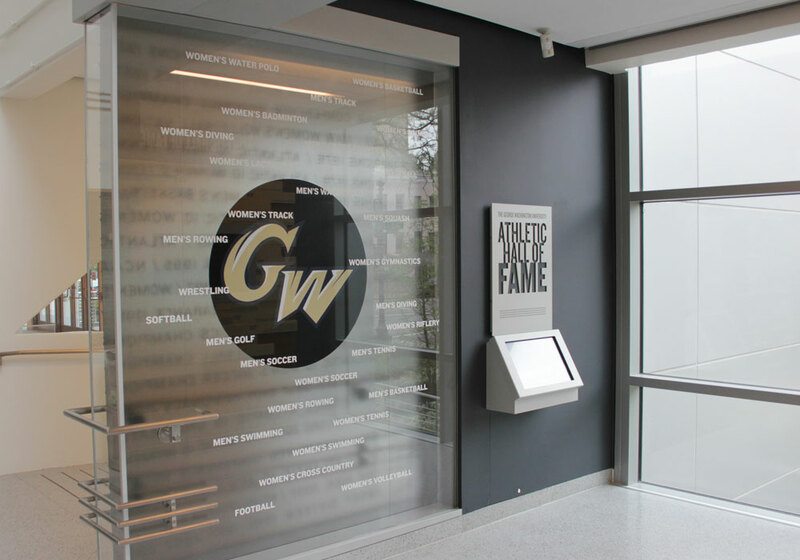 In the small alcove a simple but elegant monitor interactive is mounted to the wall where a visitor can look up former GW sports personalities to see where they are now. 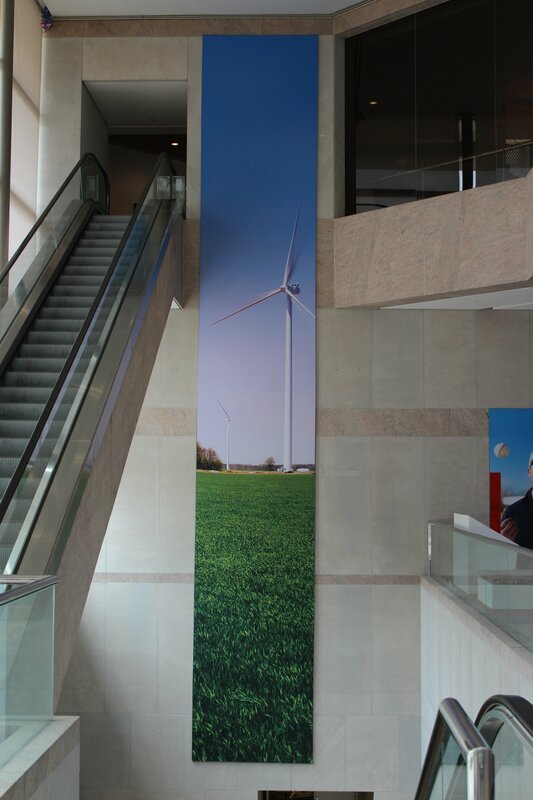 Two large custom donor panels flank each side of the main entrance hall. The 1.5” thick natural stone monuments are engraved with gold text and support 3 panels each of ½” thick glass panels with donors names silk screened in gold. 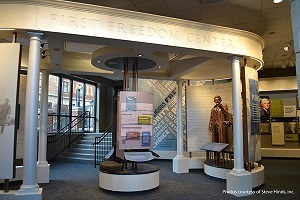 The weight of this unit was so great that additional wood blocking was required in the walls to support it. 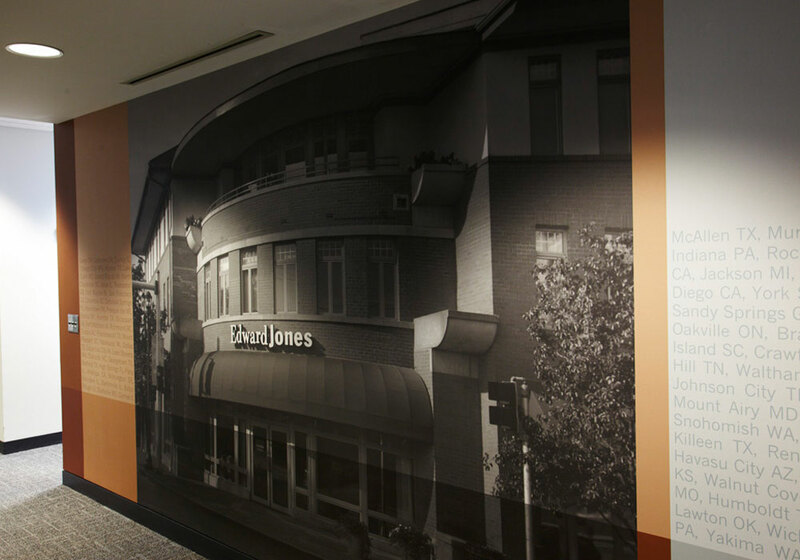 History Factory - Edward Jones “Heritage Culture & Values Program” is an international project to recognize and celebrate the history and folklore to resonate with a growing and increasingly diverse constituency. 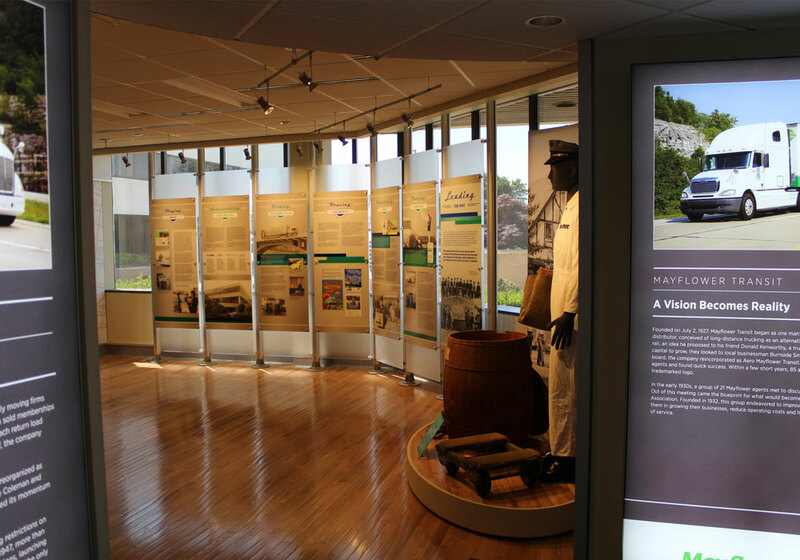 CMS has provided detailing, graphic production, fabrication and installation services on multiple campuses across the US and Canada to create a singular unified vision for cultural and historical interpretation and recognition.